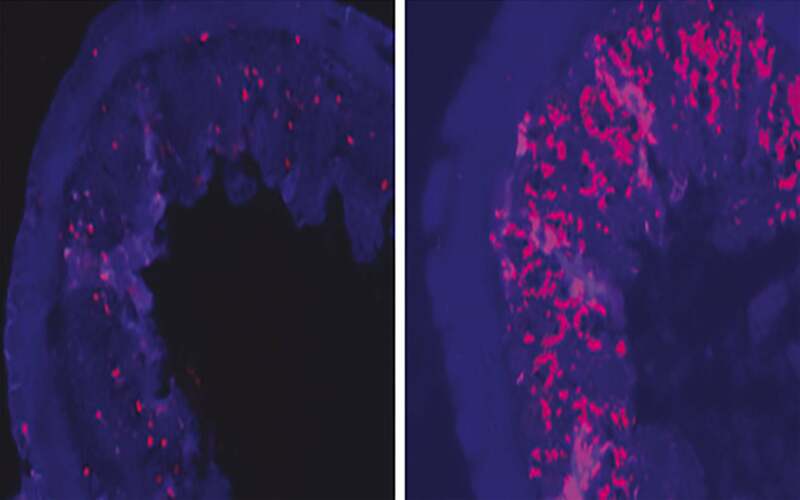 In contrast to intestinal cells in normal mice (right), cells in mice in which the RPA3 gene has been shut down by an shRNA fail to proliferate, causing the tissue to atrophy (left). Cold Spring Harbor, NY — One way of discovering a gene’s function is to switch it off and observe how the loss of its activity affects an organism. If a gene is essential for survival, however, then switching it off permanently will kill the organism before the gene’s function can be determined. Researchers at Cold Spring Harbor Laboratory (CSHL) have overcome this problem by using RNA interference (RNAi) technology to temporarily turn off any essential gene in adult mice and then turn it back on before the change kills the animals. In a study published on April 12 in the journal Proceedings of the National Academy of Sciences, the scientists demonstrated the feasibility of this approach by turning off a gene necessary for DNA replication in mice until the animals lost weight and were at the brink of death, and then successfully reversing these symptoms and rescuing the mice by turning the gene back on. The ability to regulate gene activity this way in animals “will not only help in pinpointing timeframes during which essential genes are important during development, but will also be tremendously useful in cancer or other disease-related research,” says CSHL Professor and HHMI investigator Scott Lowe, Ph.D., who co-led the team along with Professor Bruce Stillman, Ph.D., CSHL’s president. “We could, for example, first allow tumors to grow in mice, then shut off a gene that we think might be a good therapeutic target to test whether it saves the animals,” Lowe explains. To suppress gene activity with RNAi, scientists have been using short hairpin-shaped RNA (shRNA) molecules that attach to matching pieces of the target gene’s RNA and trigger its destruction, thereby shutting down the production of protein from that gene. Having refined and optimized the process of using these shRNA to knock down gene activity in mice over the last few years, Lowe and collaborators including CSHL Professor and HHMI investigator Gregory Hannon, Ph.D., came up with a technology platform, recently published in the journal Cell, that allows them to create genetically modified, or transgenic, mice within 4 months, which is three times faster than standard approaches. The current study was designed to test whether this new optimized system was robust enough to allow efficient targeting of essential genes. To find the right gene to target, the team first screened an RNAi “library,” or a large collection of shRNAs, to select only molecules that block cell proliferation by shutting off a particular gene. This screening experiment yielded shRNAs against one part—subunit 3—of replication protein A (RPA3), a protein complex discovered in Stillman’s lab in the late 1980s that promotes DNA replication by stabilizing unwinding DNA strands and recruiting other necessary proteins. The shRNAs that targeted RPA3 were linked to a fluorescent tag. These were then used to generate transgenic mice in such a way that the team could trigger RNAi and shut off the RPA3 gene when the animals were fed a drug like tetracycline but not when the drug was withdrawn. The fluorescent tag allowed the scientists to easily monitor the tissues in which the target RPA3 gene had been switched off. When the scientists induced RPA3 suppression in adult mice, the animals’ intestinal tissues rapidly atrophied and the mice lost weight and died within 8-11 days. But if the researchers withdrew the drug when the mice were almost at the point of death, both atrophy and weight loss were fully reversed and the mice survived. While the authors plan to further study these mice to understand mechanisms of tissue maintenance and regeneration, they are also excited by the broader implications of their new approach. This work was supported by generous gifts from the Don Monti Memorial Research Foundation and a program project grant from the National Institutes of Health. “Reversible suppression of an essential gene in adult mice using transgenic RNA interference,” appears in online early edition issue of the Proceedings of the National Academy of Sciences in the week of April 11. The full citation is: Katherine McJunkin, Anthony Mazurek, Prem K. Premsrirut, Johannes Zuber, Lukas E. Dow, Janelle Simon, Bruce Stillman, and Scott W. Lowe. The paper can be downloaded at http://www.pnas.org/content/early/2011/04/08/1104097108.full.pdf+html.